Using a snoring chin strap, sometimes called an apnea sling or a snore sling, holds your jaw closed as you sleep at night. This device wraps around your head and fastens to your jaw, helping to prevent snoring. Many people do not realize they are snoring unless another person tells them. Snoring can causes tension in relationships, such as keeping a spouse awake and not being able to sleep in the same bedroom. Snoring can be a symptom of sleep apnea, a sleep disorder in which a person stops breathing during sleep due to lack of airflow and wakes during the night. People who are overweight or obese might have trouble with snoring because of extra weight in the neck and throat area, and they may use a chin strap as a short-term solution. How Does a Snoring Chin Strap Work? Using anti-snoring products can give you a good night's sleep and keep the sound from being a disturbance. A chin strap for snoring is a simple and inexpensive device that fits over the head. It works by keeping your mouth closed as you sleep, providing relief from the snoring sound. It is positioned in a way that holds your jaw slightly forward, encouraging the continuous flow of air in our throat. 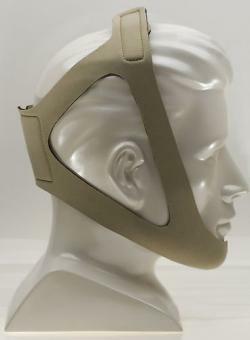 This chin strap is an effective way to keep the mouth shut and eliminate the vibrations that cause the snoring sound. Here are some options for snoring chin straps. There are also chin strips and chin pillows that work like an anti-snoring device, such as the Chin Up Strip. If you are not able to try on the chin strap before purchase, there are a couple things to keep in mind. The most important is that the device fits comfortably over the head and jaw and is easy to use. Use a chin strap that has adjustable straps and read reviews from other buyers. In addition, check into the return policy and keep trying until you find the one that works for you. While a chin strap does not cure snoring, it can be a simple way to prevent snoring. People who find relief using a chin strap should notice results right away. If you continue to need help for snoring, try a stop snoring mouthpiece or another natural sleep aid. Also, talk to your doctor if you are concerned about sleep apnea and want to try sleep apnea solutions.